Deendayal Antyodaya Yojana (DAY-NRLM) is a holistic self- employment programme for the rural poor with a time bound and outcome based approach which envisages to encompass the entire gamut of social issues and to pave the way for the poor; so that they become capable of coming out of poverty through universal social mobilization, forming and strengthening of SHGs and their federations, capacity building, financial inclusion, access to credit, skill development and taking up different livelihoods options supported with provisions of technological as well as marketing support. At least one member from each poor household would be brought under the Self-Help network. Poor are identified through PIP (Participatory Identification of Poor). Special efforts are made to identify vulnerable and marginalized households – SCs/STs, single women and women headed households, disabled, landless, migrant labourers, isolated communities and communities living in remote, hilly and disturbed areas. Saturation approach in a cluster/block is envisaged in phase wise manner within 2-3 year of a block becoming intensive. Second step: Conduct a Pre-concept seeding meeting with villagers. Purpose for conducting Pre-concept seeding meeting: To help the community in order to understand the need for SHG especially pre-existing SHGs from other programme which have either became defunct or have anomaly in SHG functioning. Process for conducting the meeting: At the beginning of the meeting the facilitator need to introduce himself/herself, identify challenges in the life of a poor family through discussion with the participants and who can address these issues. Third step: After 1 week or so from the pre-concept seeding meeting, the facilitator need to conduct the Concept seeding meeting for formation of SHG. Purpose of conducting concept seeding meeting: Explaining participants on why the meeting is conducting. Introduction & recap: Summary of the previous meeting to be elaborated so that participants can able to recollect their challenges etc. which were highlighted in the previous meeting. Sharing success stories: Showcase nearby best performing SHG to the participants so that participants are self-motivated towards forming/reviving SHG. Open house discussion: Involving all the participants to address the issues they were highlighting in the previous meeting. Conclusion of the meeting: After reasons & clarifications, lead the participants towards a final decision. Participants will finally decide if they want to form an SHG(s) or not. First step: As first step, financial audit of the concerned dormant SHG needed. If any members had taken loan from the SHG, prepare repayment schedule for the member(s) concerned and motivate the concerned member(s) to follow the repayment schedule. 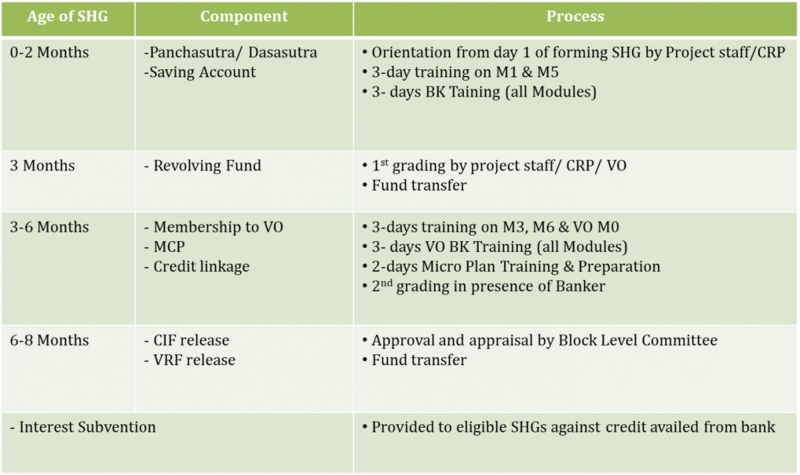 If SHG has any outstanding bank loan, prepare repayment schedule for both SHG and members. inform that SHG will be taken into NRLM fold based on the amount of outstanding bank loan of SHG. If members are from different habitation or are members of more than 1 SHG, bring the members to a consensus, so that the members will leave for SHGs with same habitation/be a part of one preferable SHG. The poor are mobilized into Self-Help Groups (SHGs). 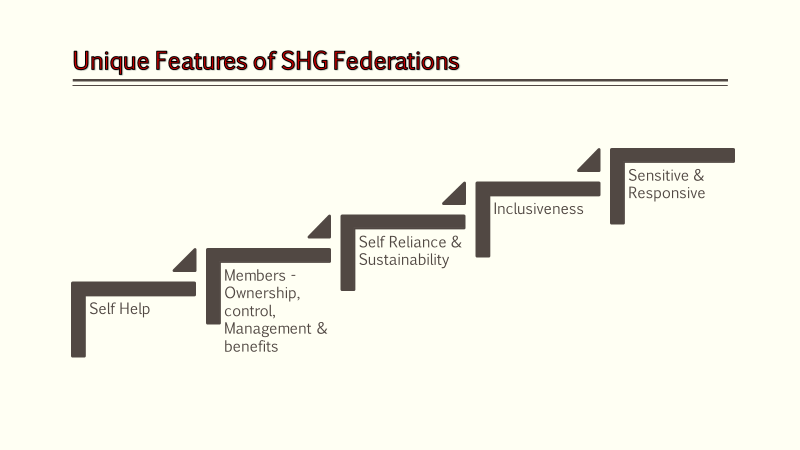 The SHGs are federated at the village and higher levels in the form of Village Organization and Cluster Level Organization. Existing institutions of the poor are also revived, strengthened and integrated into Village Organization and Cluster Level Organization. ASRLM also promotes livelihoods collectives/Producer Groups that help poor to enhance their livelihoods through deriving economies of scale, backward and forward linkages, and access to information, credit, technology, markets etc. ASRLM invests in building ‘Social Capital’ – Jeevika Sakhis/Community Resource Persons, Master Book Keepers, MCP Trainers, Bank Mitra, Krishi Sakhis, Pashu Sakhis, Bank Sakhis etc., who are crucial in making NRLM community driven and sustainable. ASRLM ensures that the poor are provided with the requisite skills for managing their institutions, linking up with markets, managing their existing livelihoods, enhancing their credit absorption capacity and credit worthiness. A multi-pronged approach is adopted for providing continuous capacity building of the targeted families, SHGs, their federations, government functionaries, bankers, NGOs and other key stakeholders. Focus is made to develop and engage community professionals and community resource persons (CRP) for capacity building of SHGs and their federations and other collectives.